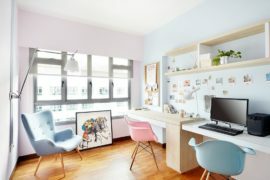 While pastels are known for their soothing effect, they are typically seen as soft and subtle rather than striking and edgy. But this season, pastels have experienced a revival of sorts. 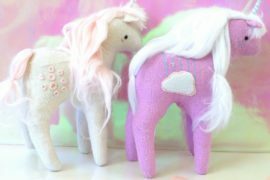 Have you noticed the prevalence of soft hues in the spring collections?! Somehow the refreshing nature of these easy-on-the-eyes shades has veered into hip territory. The twist: interesting choices, such as combining pastels with geometric patterns and other pastels. This new take on a classic color palette has been fabulously dreamy. 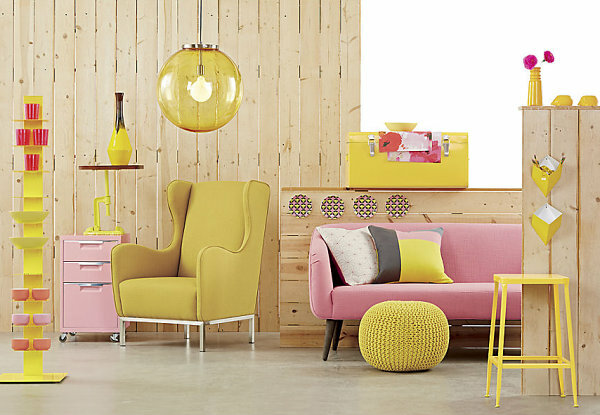 Today’s post is dedicated to shining the spotlight on new pastel décor finds for spring. Enjoy browsing some of our favorite picks below in all of their candy-colored glory! We begin with soft shades and soft materials—pastel pillows and bedding! 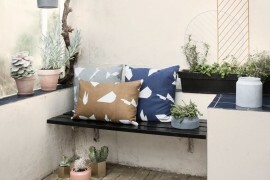 Modern retailers such as West Elm have introduced some new shades and patterns into their spring lineups. 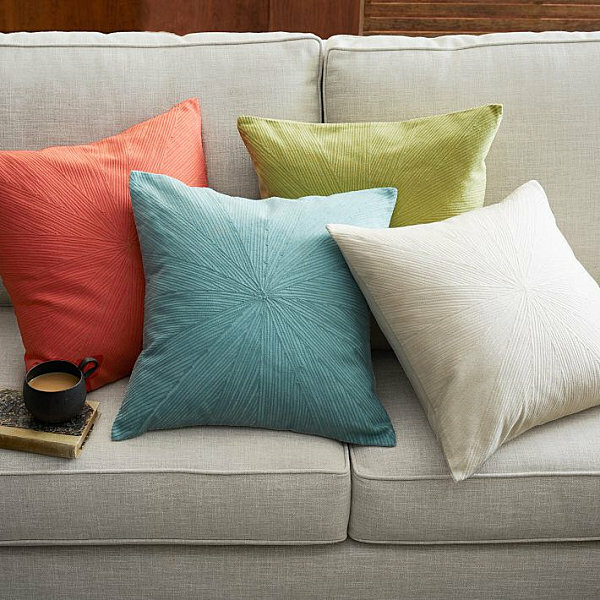 The Nomad Coverlet + Shams can be enhanced with pillows in vivid shades, as shown below. 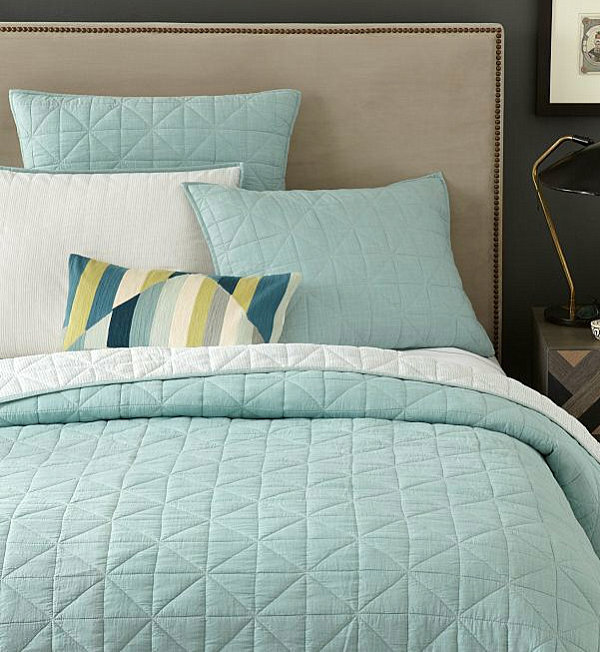 Also note the geometric stitching that covers this bedding! 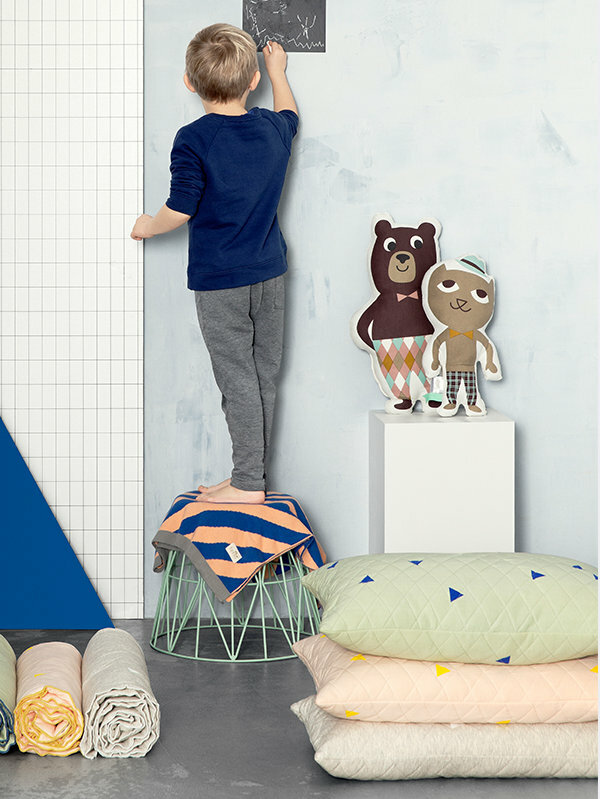 Check out the Teepee Quilted Cushions from ferm LIVING, shown at the bottom right of the image below. Triangles meet pastel shades like rose and mint. As a bonus, these geometric finds also come in blanket form! 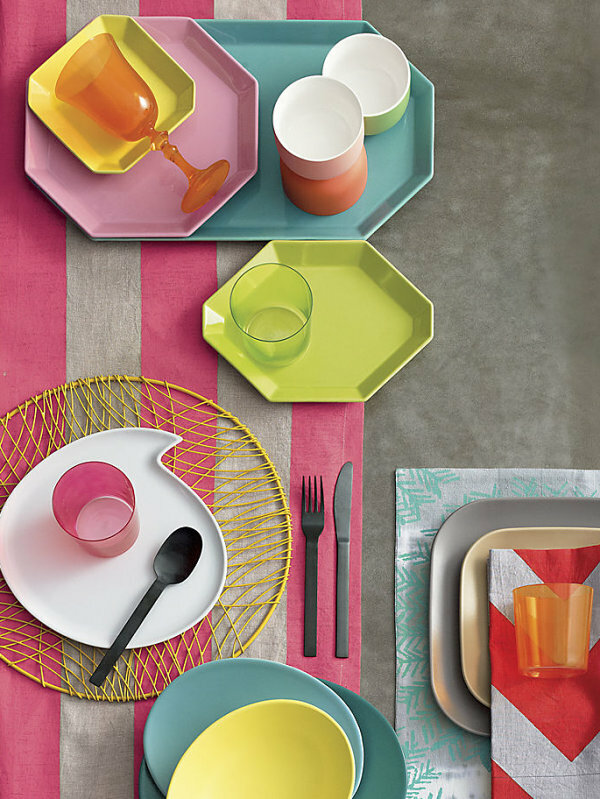 Tabletop décor for spring has been nothing short of delicious. 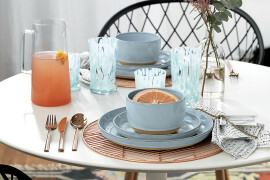 CB2 has played a big part in the candy-colored celebration, thanks to offerings such as the Intermix dinnerware below. Aqua, green, pink and yellow appear on pieces of various sizes, from a platter to a small plate. A faceted look is created by geometric forms and raised rims. 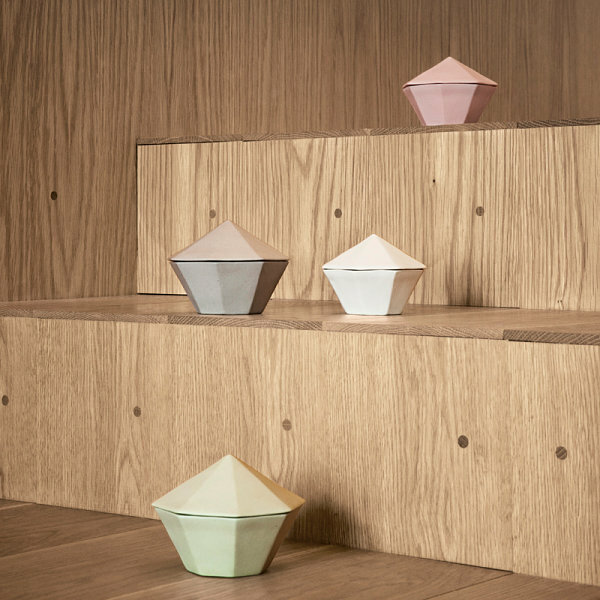 These Roundish Mini Bowls from CB2 are nothing short of yummy! Glazed porcelain makes a big statement with a simple form and a contrasting shade of white. 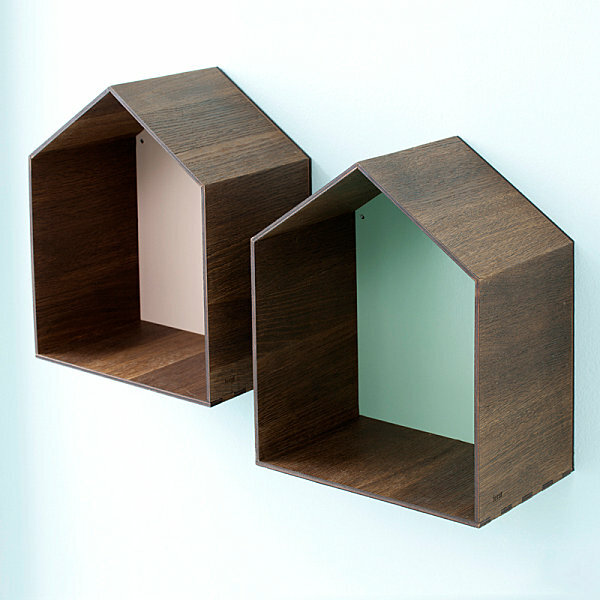 Use these tasty finds to hold items such as candy and nuts. Available in matte salmon, matte pink and glazed mint (not pictured). 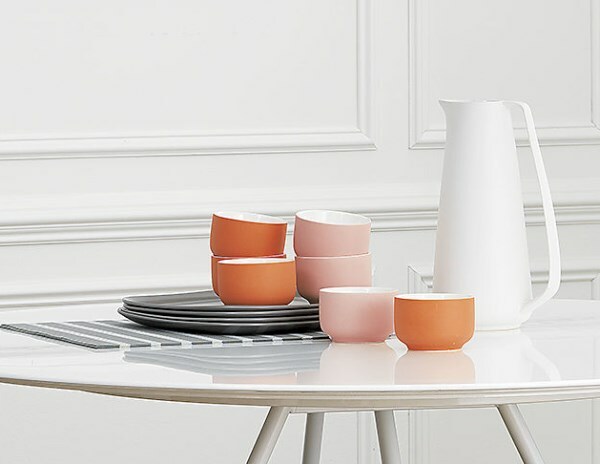 Dress up your table with a striking touch. 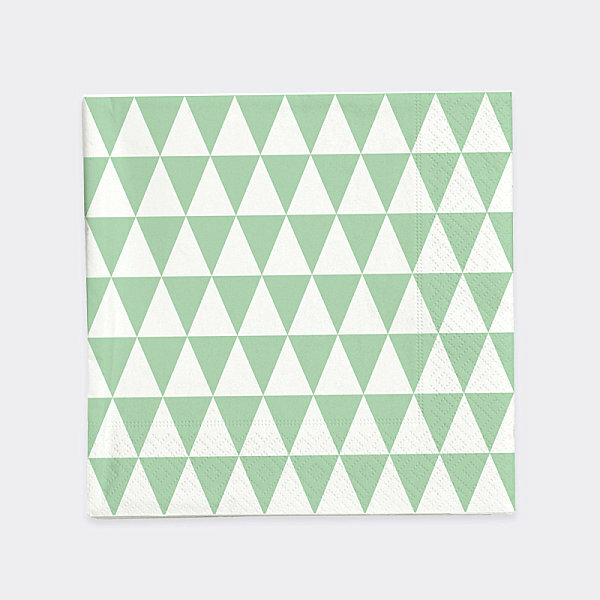 These Triangle Napkins from ferm LIVING showcase small yet bold geo forms in mint and white. At 20 to a pack, these paper napkins will go far, especially when juxtaposed with dinnerware or placemats in other pastel hues. We end with a trio of décor finds that are the pastel icing on this delectable cake. 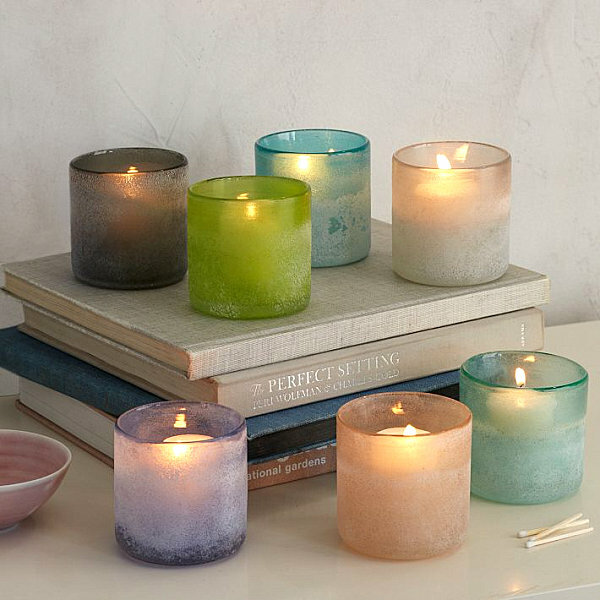 Top off your sherbet-hued vignette with a Waterscape Candleholder from West Elm. Choose from a variety of hues, including soft shades that cast a soft glow while looking good enough to eat. Today’s featured finds prove there’s strength in pastels. The key is to use them in unexpected ways. 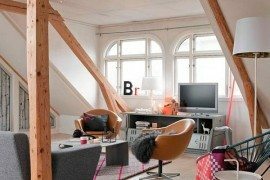 Let’s hear it for innovative design that breathes new life into a classic palette!